There are so many fun things to do during fall…take the kids trick-or-treating, binge watch scary movies, be scared on Friday the 13th, visit apple orchards, and more. Fall is a favorite season for a lot of people, and that means a lot of people love Halloween too. One of my co-workers loves the holiday, and even decorates her desk with Halloween decor! With so many great decorating options, it’s time to give your window the royal Halloween treatment! This cute and fun sign is perfect decor if you are hosting a party! I really like that these signs (the Haunted Home Hanger listed below is the same) are on the small side (8″ by 4″). The size adds to the appeal for me because I don’t want a big sign taking up my wall space. Give trick-or-treaters a little spook with this sign! It definitely won’t stop them from knocking on the door to get some goodies, but they just might second guess it! What is Halloween without some candy corn? You either love it, or you hate it. I’m not a huge fan of the candy but I can definitely get on board withthese little wood cuties! One features a painted star, and the other has a painted spider over the word “Halloween”! I just love this pillar with the little eyes peeping through the gauze! So cute and fun! This pillar isn’t a timer LED, so don’t forget to turn it off when you head to bed at night. Or you will be like me, and need to have a few packs of batteries on hand at all times. Between LED candles, and baby toys, I should buy stock in batteries! I just had to add this little guy in because I can’t get enough of his big cheesy grin! Honestly, I smile back at him every time I come across him, haha! We are good pals. 😃 He is actually an ornament so you can hang him on the wall, or even tie him to some fishing line to create the illusion that he is dropping down from his spider web! Light strands aren’t just for Christmas trees! Drape these orange teeny lights around the window to add a soft orange glow to the overall ambience of the setup. I used two strands here! Bittersweet is a KP best seller, so I wanted to incorporate it somewhere in the Halloween display. Bittersweet is the perfect fall floral with its vibrant red/orange pip berries. Check out more sale items and get your order to $60+ to earn FREE SHIPPING! How do you decorate for Halloween? Tell me in the comments! If you are already thinking of a winter wonderland, check out our new interactive holiday catalog! 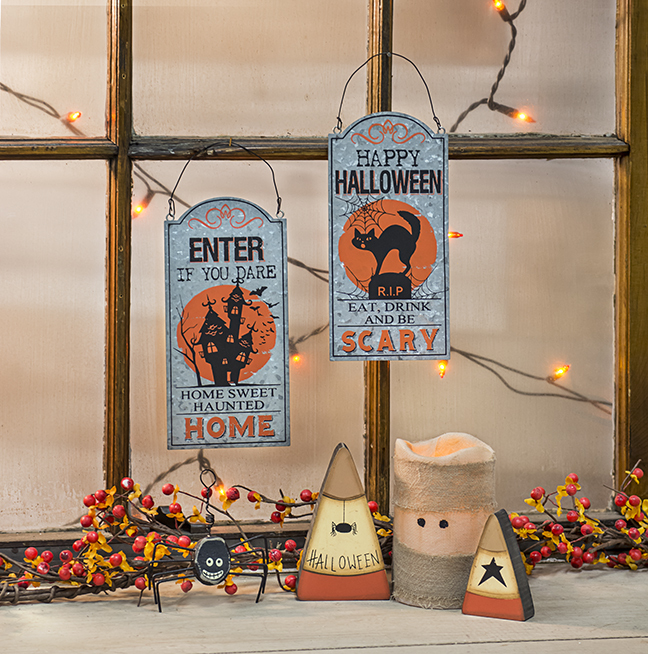 Love the spook tacular bundle, with a few things I have at home I would be all set to have an awesome display!!! It is the 14th and I will be chging to thanksgiving now…would love to be on your mailing list: sue perry at 104 renwick lane, horseheads, new york 14845 for Christmas goodies, much thanx!!!! Yes, this is our last talk of Halloween here at the blog and time to move on to Thanksgiving and Christmas! I will get your address to customer service and we will send out a catalog! Thank you so much! You are going to love our Christmas items!